Biography: Joseph O'Connor was born in Dublin. His books include the novels COWBOYS AND INDIANS (Whitbread Prize shortlist), DESPERADOES, THE SALESMAN and INISHOWEN. He has also published biography, short stories and has written several successful plays. He is the inaugural Frank McCourt Chair in Creative Writing at the University of Limerick. GHOST LIGHT was chosen as Dublin's 'One City, One Book' for April 2011, designed to encourage everyone in the city to read the same book. 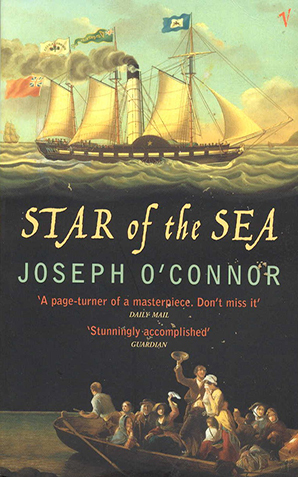 STAR OF THE SEA received international acclaim. A number one bestseller in Britain and Ireland, it won the Prix Littéraire Européen Madeleine Zepter for European Novel of the Year, the Hennessy/Sunday Tribune 'Hall of Fame' Award, Italy's Premio Giuseppe Acerbi for New Literature, France's Prix Millepages for Foreign Fiction, and was included on the New York Public Library's prestigious annual 'Books to Remember' list, for works deemed by a panel of critics to be of literary excellence. It was a 'New York Times Notable Book of the Year', runner-up in the readers' poll for 'Best Read of 2004' on British television's Richard and Judy Book Club, and nominated for the International IMPAC Literary Award. Published in dozens of languages, it was the highest selling novel of 2004 in the UK. A group of friends, once a high-flying rock band which broke up in acrimony 20 years ago, reunite to play one last concert. They are forced to face their demons, and their changed lives. Funny, poignant, and suffused with music. WHERE HAVE YOU BEEN is award-winning novelist Joseph O'Connor's first collection of short stories in more than twenty years. Two intertwined love stories, told through a narrative that moves between London and Ireland in the 1910's and 1950's. The doomed love affair between playwright J M Synge and his lover, the actress Molly Allgood is remembered by a now old, poor Molly. 1847, from Ireland torn by injustice and natural disaster, Star of the Sea sets sail for New York. On board are hundreds of fleeing refugees, some brimming with optimism, many desperate, all braving the Atlantic in search of a new home. But a camouflaged killer is stalking the decks, hungry for the vengeance that will bring absolution. A novel as urgently contemporary as it is historically revealing, it builds with the pace of a thriller to an unforgettable conclusion.